The 29cm Signature Cast Iron oval Casserole is perfect for creating meals for up to 6 people and has a cooking capacity of 4.7 litres. This is the largest size in the oval range of Cast Iron Casseroles so if you are cooking for more than 6 people regular then you should consider a bigger size in the round casserole range. Oval casseroles are very handy and ideal when roasting oval shaped cuts of meat such as poultry as it is a better fit compared to the round casserole. The new signature oval shaped range from Le Creuset feature subtle improvements, making it a more useable and ergonomic casserole, than that of the classic range. Cast iron casseroles are ideal for multi use; you can use it as a simple cooking vessel as you would saucepan or else use it on any direct heat source. It can be used to slow cook or any heat source and in the oven. Casserole pots are ideal for one pot recipes. The new Signature casserole differs in the following ways: • New easy-grip, 45% larger handles making it easier to handle and grip. • It also features a new easier clean toughened enamel interior. • The casserole has been enhanced with a tighter-fitting lid giving it a better seal to create wonderful moist dishes. • The new signature range is finished off with a stylish, heat resistant stainless steel knob As always Le Creuset Cast Iron cookware is suitable for use on all hob types, including induction, and in the oven, the casserole makes a perfect serving dish too as cast iron keeps food warmer for longer at the table. 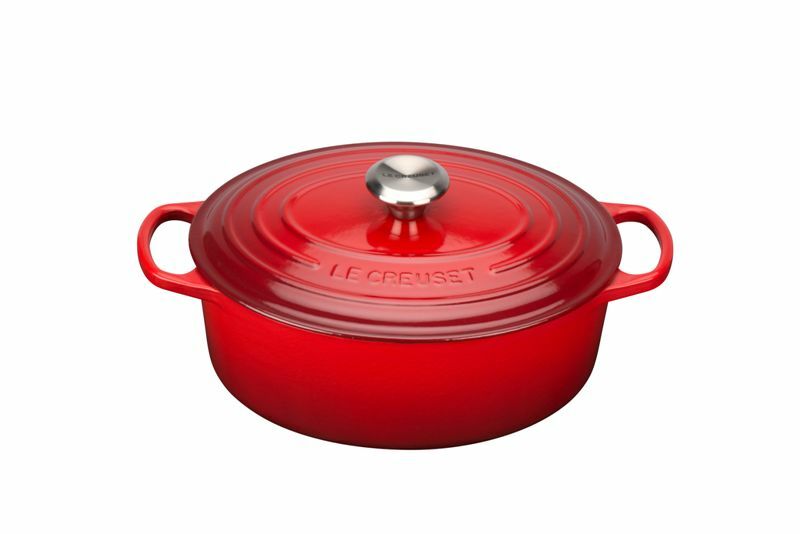 Le Creuset Cast Iron cookware is individually cast in sand moulds and hand crafted at the original French foundry since 1925.